Half-Life (stylized as HλLF-LIFE) is a first-person shooter video game developed by Valve Corporation and published by Sierra Studios for Microsoft Windows in 1998. It was Valve's debut product and the first in the Half-Life series. Players assume the role of Gordon Freeman, a scientist who must find his way out of the Black Mesa research facility after an experiment goes wrong. The core gameplay consists of fighting alien and human enemies with a variety of weapons and solving puzzles. Unlike many other games at the time, the player has almost complete uninterrupted control of Freeman, and the story is told mostly through scripted sequences seen through his eyes. Valve co-founder Gabe Newell said the team aimed to create an immersive world rather than a "shooting gallery". Half-Life received critical acclaim for its graphics, realistic gameplay, and seamless narrative. It won over fifty PC "Game of the Year" awards and is considered one the most influential titles of the first-person shooter genre, as well as one of the greatest video games of all time. By 2008, the game had sold over 9 million copies. Half-Life received expansion sets Half-Life: Opposing Force (1999) and Half-Life: Blue Shift (2001). The game was ported to the PlayStation 2 in 2001, along with another expansion Half-Life: Decay, as well as to macOS and Linux in 2013. The game's engine, GoldSrc, is a heavily modified version of the Quake engine, licensed from id Software, the framework of which would become the heavily utilized Source engine. Half-Life itself was remade as Half-Life: Source in 2004. Half-Life sparked numerous fan-made mods, several of them becoming standalone games, notably Counter-Strike, Day of Defeat and Team Fortress. A sequel, Half-Life 2, was released in 2004. An unofficial remake of Half-Life titled Black Mesa was released in 2015 as a mod of Half-Life 2. Half-Life is a first-person shooter that requires the player to perform combat tasks and puzzle solving to advance through the game. Unlike most of its peers at the time, Half-Life used scripted sequences, such as a Vortigaunt ramming down a door, to advance major plot points. Compared to most first-person shooters of the time, which relied on cut-scene intermissions to detail their plotlines, Half-Life's story is told mostly by means of scripted sequences (bar one short cutscene), keeping the player in control of the first-person viewpoint. In line with this the player rarely loses the ability to control the player character, who never speaks and is never actually seen in the game; the player sees "through his eyes" for the entire length of the game. Half-Life has no "levels"; it instead divides the game into chapters, whose titles flash on the screen as the player moves through the game. Progress through the world is continuous, except for short pauses for loading. The game regularly integrates puzzles, such as navigating a maze of conveyor belts or using nearby boxes to build a small staircase to the next area the player must travel to. Some puzzles involve using the environment to kill an enemy, like turning a valve to spray hot steam at their enemies. There are few bosses in the conventional sense, where the player defeats a superior opponent by direct confrontation. Instead, such organisms occasionally define chapters, and the player is generally expected to use the terrain, rather than firepower, to kill the boss. Late in the game, the player receives a "long jump module" for the HEV suit, which allows the player to increase the horizontal distance and speed of jumps by crouching before jumping. The player must rely on this ability to navigate various platformer-style jumping puzzles in Xen toward the end of the game. For the most part the player battles through the game alone, but is occasionally assisted by non-player characters; specifically security guards and scientists who help the player; the guards will fight alongside the player, and both guards and scientists can assist in reaching new areas and impart relevant plot information. An array of alien enemies populate the game, including headcrabs, bullsquids, and headcrab zombies. The player also faces human opponents, in particular, Hazardous Environment Combat Unit (HECU) Marines and black ops assassins. Most of the game takes place in the Black Mesa Research Facility: a fictional scientific complex built in a remote desert region of New Mexico. The game's protagonist is theoretical physicist Gordon Freeman, who becomes one of the survivors of an experiment that goes horribly wrong, when an unexpected "resonance cascade"—a fictitious phenomenon—rips dimensional seams, devastating the facility. Hostile aliens from the Xen dimension subsequently enter Black Mesa through these dimensional seams, attacking any human on sight. With the cooperation of surviving scientists and security officers, Freeman tries to escape the ruined facility, but soon discovers that he is caught between two sides: the hostile aliens and the Hazardous Environment Combat Unit, a U.S. Marine Corps special operations unit dispatched to eliminate the aliens and any surviving Black Mesa personnel—both to cover up the incident, and destroy all contamination. Throughout the game, a mysterious figure known (but not actually referred to in-game) as the "G-Man" regularly appears and seems to be monitoring Freeman's progress. Ultimately, Freeman's goal shifts to reaching Black Mesa's mysterious "Lambda Complex" (signified with the Greek lambda character "λ"), where a team of survivors are rumored to have found a way to end the disaster once and for all. Physicist Gordon Freeman arrives late for work at the Black Mesa Research Facility. He dons his Hazardous Environment (HEV) suit to carry out an experiment taking place in the Anomalous Materials section of the facility. When he pushes an unusual material into an anti-mass spectrometer for analysis, the spectrometer explodes, creating a "resonance cascade" that opens a portal to another dimension: Xen. Gordon escapes the destroyed lab. Survivors tell him that communications with the outside world have been cut and urge him to head to the surface. Gordon fights his way through Black Mesa, defending himself against hostile Xen creatures (such as Vortigaunts and parasitic headcrabs), and U.S. Marines sent to cover up the incident. On the surface, Gordon learns that scientists from the Lambda Complex may have found a way to close the portal. Gordon travels to the other end of the facility to assist them. Along the way, he activates a rocket engine test facility to destroy a giant tentacled creature and uses a disused railway system to reach and launch a satellite rocket. After he is captured by marines and left for dead in a garbage compactor, he escapes and makes his way to an older part of the facility, where he discovers Xen specimens collected before the resonance cascade. Overwhelmed by the aliens, the Marines pull out of Black Mesa and begin airstrikes. Scaling cliffs, navigating destroyed buildings, and traversing through underground water channels, Gordon finally arrives at the Lambda Complex, where scientists have developed teleportation technology that allows travel to Xen. The remaining staff tells Gordon that the satellite failed to reverse the effects of the resonance cascade as an immensely powerful being on the other side of the rift is keeping it open. The scientists activate the teleporter to send Gordon to Xen and stop the being. In Xen, Gordon encounters the remains of researchers before him and defeats Gonarch, the huge egg-laying headcrab. At a factory creating alien soldiers, he enters a giant portal that sends him to a vast cave. There, Gordon confronts the Nihilanth, the entity maintaining the rift, and destroys it. Gordon is then awoken by the mysterious G-Man, who has been watching his progress and praises his performance. The G-Man explains that his "employers" wish to employ Gordon. If he accepts, the G-Man congratulates him and places him into stasis. If he refuses, he is teleported to an area full of alien soldiers and is presumably killed. Half-Life in many ways was a reactionary response to the trivialization of the experience of the first-person genre. Many of us had fallen in love with video games because of the phenomenological possibilities of the field and felt like the industry was reducing the experiences to least common denominators rather than exploring those possibilities. Our hope was that building worlds and characters would be more compelling than building shooting galleries. Valve, based in Kirkland, Washington, was founded in 1996 by former Microsoft employees Mike Harrington and Gabe Newell. For its first product, Valve settled on a concept for a horror first-person shooter (FPS) game using the Quake engine licensed from id Software. Valve eventually modified 70% of the engine's code, adding skeletal animation and Direct3D support. The game was originally inspired by FPS games Doom (1993) and Quake (1996), Stephen King's 1980 novella The Mist, and a 1963 episode of The Outer Limits titled "The Borderland". Its plot was later developed by Valve's in-house writer and author, Marc Laidlaw, who wrote the books Dad's Nuke and The 37th Mandala. According to designer Harry Teasley, id's 1993 game Doom was a major influence, and the team wanted Half-Life to "scare you like Doom did". The project had the working title Quiver, after the Arrowhead military base from The Mist, an early inspiration for the game. The name Half-Life was chosen because it was evocative of the theme, not clichéd, and had a corresponding visual symbol: the Greek letter λ (lower-case lambda), which represents the decay constant in the half-life equation. According to Half-Life's level designer Brett Johnson, the game's level design was inspired by the environments depicted in the Japanese cyberpunk manga series Akira. Valve struggled to find a publisher, as many believed the game was too ambitious for a first-time developer. Sierra On-Line signed Valve for a one-game deal as it was interested in making a 3D action game, especially one based on the Quake engine. Valve first showed Half-Life in early 1997; it was a success at Electronic Entertainment Expo (E3) that year, where Valve demonstrated the game's animation and artificial intelligence. Novel features of the artificial intelligence included fear and pack behavior. Valve aimed for a November 1997 release to compete with Quake II. By September 1997, the team found that while they had built a number of innovative aspects in weapons, enemies, and level design, the game was not fun and there was little design cohesion. The company postponed the release and reworked every level. They took a novel approach of assigning a small team to build a prototype level containing every element in the game, and then spent a month iterating on the level. When the rest of the team played the level, which designer Ken Birdwell described as "Die Hard meets Evil Dead", they agreed to use it as a baseline. The team developed three theories about what made the level fun. First, the level had a number of interesting things happen in it and all when the player came into near proximity of the event, rather than based on time elements, so that the player would set the pace of the level. Second, the level had means to respond to any player action, even for something as simple as adding graphic decals to wall textures to show a bullet impact. Finally, the level warned the player of imminent danger to allow them to avoid it, rather than killing the player with no warning. To move forward with this unified design, Valve sought a game designer, but found no one suitable for the job. Instead, Valve created the "cabal", initially a group of six individuals from across all departments that worked primarily for six months straight in six-hour meetings four days a week. The cabal was responsible for all elements of design, including level layouts, key events, enemy designs, narrative, and the introduction of gameplay elements relative to the story. The collaboration proved successful, and once the cabal had come to decisions on types of gameplay elements that would be needed, mini-cabals formed from other departments most affected by the choice were formed to implement these elements. Membership in the main cabal rotated, since commitment required created burnout. The cabal produced a 200-page design document detailing nearly every aspect of the game. They also produced a 30-page document for the game's narrative, and hired Laidlaw, to help manage that script. The soundtrack was composed by Kelly Bailey. Within a month of the cabal's formation, the other team members started detailed game development, and within another month, began playtesting through Sierra. The cabal was intimately involved with playtesting, monitoring the player but otherwise not interacting. They noted any confusion or inability to solve a game's puzzles and made them into action items to be fixed on the next iteration. Later, with most of the main adjustments made, the team included means to benchmark players' actions which they then collected and interpreted statistically to further fine-tune levels. Between the cabal and playtesting, Valve identified and removed parts that proved unenjoyable. Birdwell said that while there were struggles at first, the cabal approach was critical for Half-Life's success, and was reused for Team Fortress 2 from the start. Much of the detail of Half-Life's development has been lost; according to employee Erik Johnson, two or three months before release, their volume shadow service "exploded"; they had to compile what they could from was otherwise stored on individual computers at that time, meaning that only the last month of technical changes were preserved. This included saving the source to GoldSrc. Half-Life was released in November 1998. The revised version of Half-Life shown at E3 1998 was given Game Critics Awards for "Best PC Game" and "Best Action Game". Valve released two demos for Half-Life. The first, Half-Life: Day One, contained the first fifth of the game and was distributed with certain graphic cards. The second demo, Half-Life: Uplink, was released on February 12, 1999 and featured original content. A short film based upon Half-Life entitled Half-Life: Uplink, was developed by Cruise Control, a British marketing agency, and was released on February 11, 1999. The film's protagonist is a journalist who infiltrates the Black Mesa Research Facility, trying to discover what has happened there. Half-Life was heavily censored for its German release as to comply with the Federal Department for Media Harmful to Young Persons (BPmJ by its German abbreviation). Newell had stated at the time of Half-Life's release that to comply with the BPmJ's regulations on violence against humans, they had to replace all the humans in the game with robots, replacing any blood with oil and body parts with gears, among other changes. This allowed for the game to be released but was placed on a list maintained by BPmJ that prevent sales of the game to anyone under 18 years old. In 2017, BPmJ removed Half-Life from its list, and to acknowledge this, Valve released Half-Life Uncensored, free downloadable content for those in Germany to patch Half-Life and revert these changes. Half-Life was ported to the PlayStation 2 by Gearbox Software and released in 2001. This version of the game had a significant overhaul in terms of both character models, weapons, and more advanced and extended levels and general map geometry, incorporated from work on a planned Dreamcast version. Also added in is a head-to-head play and a co-op expansion Half-Life: Decay that allowed players to play as the two female scientists Dr. Cross and Dr. Green at Black Mesa. A version for Mac OS, ported by Logicware, was announced but never released. Captivation Digital Laboratories was slated to develop a port to the Dreamcast, to be released near the end of 2000. The Dreamcast version revamped the graphics of the game with double the polygon count of the original models. Like Opposing Force for PC and Decay for PlayStation 2, the Dreamcast version was set to have its own exclusive expansion, Blue Shift. However, after many delays, the Dreamcast version was canceled in June 2001 due to "changing market conditions". The Blue Shift expansion was then preserved and ported over to become Half-Life's second expansion for PC. The Dreamcast version, in a near finished state, was eventually leaked onto the internet. That year, Sierra On-Line showed its PlayStation 2 port at E3 2001. This version was released in North America in late October of the same year, followed by a European release just a month later. Around the same time, Half-Life: Blue Shift, which was intended to be the Dreamcast-exclusive side story, was eventually released on Windows as the second Half-life Expansion Pack. It featured the "High Definition Pack", upgraded models originally in the Dreamcast version. On January 29, 2013, Valve released beta versions of ports for OS X and Linux. Valve finalized them on February 14, 2013. Two expansion packs by outside developer Gearbox Software have been released for the PC version: Half-Life: Opposing Force (1999) and Half-Life: Blue Shift (2001). The former returns the player to Black Mesa during the events of Half-Life's storyline, but this time from the perspective of Adrian Shephard, one of the Marines in the Hazardous Environment Combat Unit sent to cover up evidence of the incident. It introduced several new weapons, new non-player characters, both friendly and hostile and new, previously unseen areas of the facility. Blue Shift returns the player to Half-Life's Black Mesa timeline once more, this time as Barney Calhoun, one of the facility's security guards. The expansion was originally developed as a bonus mission for the canceled Dreamcast version. Blue Shift came with the High Definition pack, that gave the player the option to update the look of Half-Life, Opposing Force, and the new Blue Shift content. Decay was another expansion by Gearbox, released only as an extra with the PlayStation 2 version of Half-Life. The add-on featured co-operative gameplay in which two players could solve puzzles or fight against the many foes in the Half-Life universe. In 2000, a compilation pack titled Half-Life: Platinum Pack was released, including (with their respective manuals) Half-Life, Counter-Strike, Team Fortress Classic, Half-Life: Opposing Force. In 2002, the pack was re-released under the new titles Half-Life Platinum Collection and Half-Life: Generation. 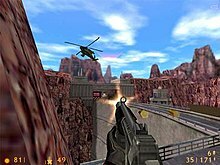 These new iterations also included the Half-Life: Blue Shift expansion pack; though if registered on Steam, Day of Defeat, as well as Ricochet and Deathmatch Classic were also included. In 2005, Half-Life 1: Anthology was released, containing Steam-only versions of the following games on a single DVD: Half-Life, Half-Life: Opposing Force, Half-Life: Blue Shift, and Team Fortress Classic. Half-Life 2 was announced at E3 in May 2003 and released on November 16, 2004. The player controls Gordon Freeman 20 years after the Black Mesa incident in the dystopic City 17, where he must fight as part of a rebellion against an alien regime. It was followed by two episodic sequels, Half-Life 2: Episode One and Half-Life 2: Episode Two, released on June 1, 2006, and October 10, 2007, respectively. To experience firsthand the processes mod-makers would have to go through with the new engine, Valve ported Half-Life (dubbed Half-Life: Source) and Counter-Strike to their new Source engine. Half-Life: Source is a straight port, lacking any new content or the Blue Shift High Definition pack. However, it does take advantage of vertex and pixel shaders for more realistic water effects, as well as Half-Life 2's realistic physics engine. They also added several other features from Half-Life 2, including improved dynamic lightmaps, vertex maps, ragdolls, and a shadowmap system with cleaner, higher resolution, specular texture and normal maps, as well as utilization of the render-to-texture soft shadows found in Half-Life 2's Source engine, along with 3D skybox replacements in place of the old 16-bit color prerendered bitmap skies. The Half-Life port possesses many of the Source engine's graphical strengths as well as control weaknesses that have been noted in the Source engine. Later updates added a field of view option, support for OS X and Linux, an optional high-definition texture pack, among other improvements. Half-Life: Source is available with special editions of Half-Life 2, or separately on Steam. Half-Life Deathmatch: Source, the multiplayer portion of the original game, much in the same fashion as the earlier released Half-Life: Source, was released in July 2005. Half-Life: Source had been criticized for not fully utilizing many of the features of the Source engine found in Half-Life 2, as it still uses textures and models from the original game. In response to this, a third-party mod remake called Black Mesa was developed with Valve's approval. Black Mesa, a fan-made remake of Half-Life utilizing the Source engine, began development in 2005, and was released as a free download on September 14, 2012, lacking only the final Xen chapter. The Xen portion was held back as the project team wanted to revamp this to try to address how the original Xen was poorly received compared to the rest of the game. The free 2007 Source SDK base is needed to run the game. Black Mesa is also distributed via Steam; the remake was among the first ten titles whose release on the platform was approved using Valve's crowd voting service Steam Greenlight. A separate effort, Project Lambda, is attempting to recreate Half-Life in the Unreal Engine, allowing the game to support more advanced graphic features. Half-Life saw fervent support from independent game developers, due in no small part to support and encouragement from Valve. Worldcraft, the level-design tool used during the game's development, was included with the game software. Printed materials accompanying the game indicated Worldcraft's eventual release as a retail product, but these plans never materialized. Valve also released a software development kit, enabling developers to modify the game and create mods. Both tools were significantly updated with the release of the version 1.1.0.0 patch. Supporting tools (including texture editors, model editors, and level editors such as the multiple engine editor QuArK) were either created or updated to work with Half-Life. The Half-Life software development kit served as the development base for many multiplayer mods, including the Valve-developed Team Fortress Classic and Deathmatch Classic (an updated version of Quake). Other mods such as Counter-Strike and Day of Defeat (DOD) began life as the work of independent developers (self-termed "modders") who later received aid from Valve. Other multiplayer mods include Action Half-Life, Firearms, Science and Industry, The Specialists, Pirates, Vikings and Knights, Natural Selection and Sven Co-op. Numerous single-player mods have also been created. Notable examples include USS Darkstar (1999, a futuristic action-adventure on board a zoological research spaceship), They Hunger (2000–2001, a survival horror total conversion trilogy involving zombies), Poke646 (2001, a follow-up to the original Half-Life story with improved graphics), and Someplace Else (2002, a side-story to the original Half-Life). In 2003, Valve's network was infiltrated by hackers. Among the files included an unreleased Half-Life modification: "Half-Life: Threewave", a canceled remake of the mod Threewave CTF from Quake. The files were later found by Tyler McVicker from a Vietnamese FTP server on February 2016 and were released unofficially in September 2016. Some Half-Life modifications eventually landed on retail shelves. Counter-Strike was the most successful, having been released in six different editions: as a standalone product (2000), as part of the Platinum Pack (2000), as an Xbox version (2003), and as a single-player spin-off titled Counter-Strike: Condition Zero (2004), as well as in two versions using the Source engine. Team Fortress Classic, Day of Defeat, Gunman Chronicles (2000, a futuristic Western movie-style total conversion with emphasis on its single-player mode) and Sven Co-op were also released as standalone products. According to Gabe Newell, Half-Life was budgeted with the expectation of lifetime sales around 180,000 units. However, following its November 19 release, the game became a surprise hit. In the United States, Half-Life debuted at #8 on PC Data's weekly computer game sales chart for the November 15–21 period, with an average retail price (ARP) of $49. It rose to sixth place the following week, before dropping to position 10 for the week ending December 5. During the December 6–12 period, the game climbed back to sixth place; by this time, its ARP had dropped to $36. It placed between sixth and eighth on PC Data's weekly charts through the end of December, and its ARP rose back to $45 by the week ending January 2. PC Data declared Half-Life November's sixth-best-selling computer game in the United States, a position it held for the month of December. 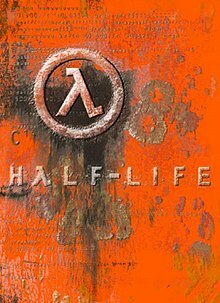 While its sales were below 100,000 copies in the country by November 30, Half-Life ultimately sold 212,173 units and earned revenues of $8.6 million in the United States by the end of 1998. During January 1999, Half-Life debuted at #3 on Chart-Track's computer game sales rankings for the United Kingdom, and remained in PC Data's weekly top 10 for the entire month, peaking at #4. After two full months of availability, overall sales of Half-Life surpassed 500,000 units by January 19. In the United States, it was the fifth-best-selling computer game for the month of January. On PC Data's weekly charts, it rose to #2 from February 7–20, with an ARP of $35. Holding a position in the weekly top 10 for the rest of February, it climbed to fourth for the month. The game remained in PC Data's weekly top 10 until the week of March 21, and dropped to position 11 for March as a whole. In the United Kingdom, it placed second in February—behind the debut of Baldur's Gate—and fifth in March. In April, it claimed #3 on Chart-Track's rankings and dropped to #16 on those of PC Data. On April 23, Sierra announced that global sales of Half-Life had reached almost 1 million copies. After maintaining 16th place for May in the United States, Half-Life exited PC Data's monthly top 20 in June. Half-Life ultimately became the fifth-best-selling computer game of the first half of 1999 in the country. Its domestic sales during 1999 reached 290,000 copies by the end of September. During 1999, it was the fifth best-selling computer game in the United States, with sales of 445,123 copies. These sales brought in revenues of $16.6 million, the sixth-highest gross that year for a computer game in the United States. The following year, it was the country's 16th best-selling computer game, selling another 286,593 copies and earning $8.98 million. The game's PlayStation release received a "Silver" sales award from the Entertainment and Leisure Software Publishers Association (ELSPA), indicating sales of at least 100,000 copies in the United Kingdom. Half-Life's global sales reached 2.5 million units by July 2001. A writer for Edge noted in 2003 that "a significant number of the 7.5m copies of the PC version were bought because the game offered such potential for community-driven expansion." As of November 16, 2004, eight million copies of the game had been sold, by 2008 9.3 million copies had been sold at retail. Guinness World Records awarded Half-Life with the world record for Best-Selling First-Person Shooter of All Time (PC) in the Guinness World Records: Gamer's Edition 2008. Half-Life has a score of 96 out of 100 on aggregate review website Metacritic. Computer Gaming World's Jeff Green said that the game "is not just one of the best games of the year. It's one of the best games of any year, an instant classic that is miles better than any of its immediate competition, and - in its single-player form - is the best shooter since the original Doom". IGN described it as "a tour de force in game design, the definitive single player game in a first person shooter". IGN has also described the game as one of the most influential video games, saying that the history of the FPS genre "breaks down pretty cleanly into pre-Half-Life and post-Half-Life eras." GameSpot claimed that it was the "closest thing to a revolutionary step the genre has ever taken". The immersive gaming experience and the interactive environment were cited by several reviewers as being revolutionary. AllGame said, "It isn't everyday that you come across a game that totally revolutionizes an entire genre, but Half-Life has done just that". Hot Games commented on the realism of the game, and how the environment "all adds up to a totally immersive gaming experience that makes everything else look quite shoddy in comparison". Gamers Depot found the game engaging, stating that they have "yet to play a more immersive game period". Despite the praise that the game has received, there have also been some complaints. The Electric Playground said that Half-Life was an "immersive and engaging entertainment experience", but said that this only lasted for the first half of the game, explaining that the game "peaked too soon". The Academy of Interactive Arts & Sciences nominated Half-Life for its 1998 Outstanding Achievement in Character or Story Development award, although the game lost to Pokémon Red and Blue. In the November 1999, October 2001, and April 2005 issues of PC Gamer, Half-Life was named Best Game of All Time/Best PC Game Ever. In 2004, GameSpy held a Title Fight, in which readers voted on what they thought was the greatest game of all time, and Half-Life was the overall winner of the survey. Gamasutra gave it their Quantum Leap Award in the FPS category in 2006. GameSpot inducted Half-Life into their Greatest Games of All Time list in May 2007. ^ "Reviews • Half-Life". PC Gamer UK. No. 68. Future Publishing. December 1998. p. 86. ^ a b c "Half-Life Review". IGN. Archived from the original on November 26, 2007. Retrieved April 25, 2007. ^ a b Bell, Joe Grant (November 25, 1998). Half-Life : Prima's Official Strategy Guide. Prima Games. ISBN 0-7615-1360-4. ^ Tufnell, Nicholas (November 25, 2011). "Interview: Gabe Newell". The Cambridge Student Online. Archived from the original on November 26, 2011. Retrieved November 26, 2011. ^ a b "Final Hours of Half-Life: The Microsoft Millionaires". GameSpot. Archived from the original on May 20, 2012. Retrieved September 12, 2006. ^ a b Hodgson, David (2004). Half-Life 2: Raising the Bar. Prima Games. ISBN 0-7615-4364-3. ^ a b "The Final Hours of Half-Life: The Valve Difference". GameSpot. Archived from the original on February 24, 2011. Retrieved September 14, 2006. ^ "The Final Hours of Half-Life: The Right E-mail, the Right Time". GameSpot. Archived from the original on February 24, 2011. Retrieved September 14, 2006. ^ "The Final Hours of Half-Life: The Public Debut". GameSpot. Archived from the original on March 8, 2010. Retrieved September 14, 2006. ^ "NG Alphas: Half Life". Next Generation. No. 32. Imagine Media. August 1997. pp. 106–7. ^ a b c d e f g h i j Birdwell, Ken (December 10, 1999). "The Cabal: Valve's Design Process For Creating Half-Life". Gamasutra. Archived from the original on November 16, 2016. Retrieved February 14, 2017. ^ a b c "The Final Hours of Half-Life: Reassembling the Pieces". GameSpot. Archived from the original on September 28, 2011. Retrieved September 14, 2006. ^ Wawro, Alex (February 13, 2017). "Valve explains why we'll never see the full history of Half-Life's development". Gamasutra. Archived from the original on February 14, 2017. Retrieved February 13, 2017. ^ "Valve Archive - Half-Life: Uplink Demo". valvearchive.com. Retrieved March 19, 2019. ^ IGN Staff (February 11, 1999). "Half Life Demo is Here!". IGN. ^ Frank, Allegra (May 4, 2017). "Half-Life goes uncensored in Germany, two decades after original release". Polygon. Retrieved March 22, 2019. ^ Ostergrad, Genevieve (April 23, 1999). "Sierra studios to deliver best-selling half-life to the mac". PlanetFortress.com. IGN Entertainment. Archived from the original on February 23, 2012. Retrieved July 18, 2016. ^ Chau, Anthony (June 18, 2001). "Not Given Half A Chance: The Cancellation of Half-Life". IGN. IGN Entertainment. Archived from the original on August 4, 2016. Retrieved July 18, 2016. ^ IGN Staff (March 29, 2001). "Ready to Jump Back into the Black Mesa Research Facility?". IGN. IGN Entertainment. Archived from the original on August 20, 2016. Retrieved July 18, 2016. ^ "Not Given Half A Chance: The Cancellation of Half-Life". IGN. Archived from the original on September 24, 2006. Retrieved September 3, 2006. ^ alfred (January 29, 2013). "Half-Life 1 Beta released". Steam. Valve Corporation. Archived from the original on August 14, 2016. Retrieved July 18, 2016. ^ alfred (February 14, 2013). "Half-Life 1 update released". Steam. Valve Corporation. Archived from the original on August 14, 2016. Retrieved July 18, 2016. ^ "Half-Life 1 Anthology on Steam". store.steampowered.com. Retrieved March 24, 2019. ^ Thorsen, Tor (May 24, 2006). "Half-Life 2: Episode One gold, Two dated, Three announced". GameSpot. Archived from the original on November 25, 2013. Retrieved April 27, 2007. ^ "Half-Life: Source update released". Steam. Valve Corporation. September 25, 2013. Archived from the original on March 20, 2015. Retrieved March 9, 2015. ^ Harris, Wil (September 18, 2004). "Half Life 2 release candidate goes to Vivendi". The Inquirer. Archived from the original on June 4, 2008. Retrieved March 27, 2008. ^ "Half-Life: Deathmatch - Source for Windows (2005)". MobyGames. Retrieved March 22, 2019. ^ Kelly, Andy (November 2, 2017). "The story of Half-Life remake Black Mesa". PC Gamer. Retrieved September 16, 2018. ^ Grayson, Nathan (May 9, 2012). "Interview: What Happened To Black Mesa: Source? Part 1". Rock, Paper, Shotgun. Archived from the original on September 8, 2012. Retrieved September 22, 2012. ^ Senior, Tom (September 3, 2012). "Black Mesa Source release date revealed, high-res headcrabs due in 11 days". PC Gamer. Future Publishing Limited. Archived from the original on September 22, 2012. Retrieved September 22, 2012. ^ Cobbett, Richard (September 14, 2012). "Black Mesa Source released – download it now!". PC Gamer. Future Publishing Limited. Archived from the original on September 25, 2012. Retrieved September 22, 2012. ^ "Fans resurrect Half-Life video game". BBC News. BBC. September 3, 2012. Retrieved September 3, 2012. ^ McWhertor, Michael (December 22, 2016). "Half-Life remake's version of the game's controversial alien world looks great". Polygon. Retrieved December 22, 2016. ^ "First Titles Get The Community's Greenlight". Steamcommunity.com. Valve Corporation. September 11, 2012. Archived from the original on September 18, 2012. Retrieved September 22, 2012. ^ Plunkett, Luke (September 16, 2018). "Fans Are Trying To Remake Half-Life Using Unreal Engine 4". Kotaku. Retrieved September 16, 2018. ^ Walker, Trey (June 7, 2001). "Valve releases Deathmatch Classic mod for Half-Life". GameSpot. Archived from the original on October 22, 2016. ^ Orland, Kyle (September 21, 2016). "The unreleased Half-Life multiplayer mod that you can play now". Ars Technica. Archived from the original on September 22, 2016. Retrieved September 22, 2016. ^ a b c Baker, M. Sharon (February 26, 1999). "A Charmed Half-Life". Puget Sound Business Journal. Archived from the original on February 19, 2003. ^ a b Biederman, Christine (January 14, 1999). "Stormy weather". Dallas Observer. Archived from the original on October 3, 2012. ^ Mayer, Robert (December 9, 1998). "Deer Hunter II Returns to the Throne". Computer Games Strategy Plus. Archived from the original on April 6, 2005. Retrieved July 22, 2018. ^ "PC Data Best Sellers". GameSpot. December 9, 1998. Archived from the original on June 14, 2000. Retrieved July 22, 2018. ^ "Tiny Plastic Woman Beats on Half-Life". GameSpot. December 15, 1998. Archived from the original on June 21, 2000. Retrieved July 22, 2018. ^ "Barbie Holds PC Charts". GameSpot. December 22, 1998. Archived from the original on June 6, 2000. Retrieved July 22, 2018. ^ Fudge, James (January 8, 1999). "Deer Hunter 2 3D Tops Charts". Computer Games Strategy Plus. Archived from the original on April 7, 2005. Retrieved July 22, 2018. ^ "Deer Hunters Still on Top". GameSpot. January 8, 1999. Archived from the original on March 11, 2000. Retrieved July 22, 2018. ^ a b Mullen, Micheal (January 12, 1999). "Brood War Tops PC Data List". GameSpot. Archived from the original on February 29, 2000. Retrieved July 22, 2018. ^ Mayer, Robert (December 13, 1998). "November Belongs to Deer Hunter 2 3D". Computer Games Strategy Plus. Archived from the original on April 6, 2005. Retrieved July 2, 2018. ^ Ocampo, Jason (January 15, 1999). "Deer Hunter II Tops Charts". Computer Games Strategy Plus. Archived from the original on May 2, 2005. Retrieved July 22, 2018. ^ "The Numbers Game". PC Gamer US. 6 (4): 50. April 1999. ^ McNicholas, Conor (February 1999). "Charts; The ChartTrack Top 10". PC Zone (73): 30. ^ "Brood Wars Rules the Week's Charts". GameSpot. January 27, 1999. Archived from the original on March 8, 2000. Retrieved July 22, 2018. ^ "Baldur's Gate in the Lead". GameSpot. February 2, 1999. Archived from the original on February 26, 2000. Retrieved July 22, 2018. ^ "SimCity 3000: Top Seller". GameSpot. February 9, 1999. Archived from the original on March 8, 2000. Retrieved July 22, 2018. ^ "SimCity 3000 On Top". GameSpot. February 18, 1999. Archived from the original on February 29, 2000. Retrieved July 22, 2018. ^ a b "SimCity Packs 'Em In". GameSpot. March 10, 1999. Archived from the original on November 19, 2000. Retrieved July 22, 2018. ^ "SimCity 3000 Still Top Seller". GameSpot. March 16, 1999. Archived from the original on March 3, 2000. Retrieved July 22, 2018. ^ "Sim City 3000 Takes February". GameSpot. March 15, 1999. Archived from the original on November 8, 1999. Retrieved July 22, 2018. ^ "SimCity Still Number 1". GameSpot. March 25, 1999. Archived from the original on June 3, 2000. Retrieved July 22, 2018. ^ "SimCity Beats Back EverQuest". GameSpot. April 5, 1999. Archived from the original on June 19, 2000. Retrieved July 22, 2018. ^ Shoemaker, Richie (March 1999). "Charts; The ChartTrack Top 10". PC Zone (74): 74. ^ a b Shoemaker, Richie (May 1999). "Charts; The ChartTrack Top 10". PC Zone (76): 26. ^ "Sierra Studios to Deliver Best-Selling Half-Life to the Mac" (Press release). Bellevue, Washington: Sierra On-Line. April 23, 1999. Archived from the original on October 9, 1999. Retrieved July 22, 2018. ^ Fudge, James (June 15, 1999). "Star Wars Episode I: The Phantom Menace Tops Monthly Chart". Computer Games Strategy Plus. Archived from the original on May 2, 2005. Retrieved May 8, 2018. ^ Fudge, James (July 20, 1999). "Star Wars Episode I: The Phantom Menace Tops Monthly Chart". Computer Games Strategy Plus. Archived from the original on April 7, 2005. Retrieved May 8, 2018. ^ IGN Staff (August 3, 1999). "And the Winners Are ..." IGN. Archived from the original on March 5, 2000. Retrieved July 22, 2018. ^ "X-Tra; Death of the PC". PC Accelerator (18): 100, 101. February 2000. ^ "Shake Your Money-Maker". PC Gamer US. 7 (4): 32. April 2000. ^ "Prescreen focus: Half-Life 2". Edge (124): 48–53. June 2003. ^ Mike Musgrove (November 16, 2004). "Half-Life 2's Real Battle". Washington Post. Archived from the original on October 25, 2012. Retrieved February 28, 2008. ^ Remo, Chris (December 3, 2008). "Analysis: Valve's Lifetime Retail Sales For Half-Life, Counter-Strike Franchises". Gamasutra. Archived from the original on December 21, 2008. ^ "Half-Life for PC". Metacritic. Archived from the original on February 2, 2017. Retrieved November 3, 2011. ^ "Half-Life for PlayStation 2". Metacritic. Archived from the original on December 3, 2011. Retrieved November 3, 2011. ^ a b c House, Michael L. (2014). "Half-Life". Allgame. Archived from the original on November 14, 2014. ^ a b Green, Jeff (February 1, 1999). "Half-Life". Computer Gaming World. Archived from the original on February 9, 2002. Retrieved April 14, 2010. ^ a b "Half-Life Review". GameSpot. Archived from the original on October 31, 2013. Retrieved April 25, 2007. ^ "Top 10 Most Influential Games". IGN. Archived from the original on March 12, 2017. Retrieved January 6, 2008. ^ "Half-Life review". Hot Games. Archived from the original on February 1, 2003. Retrieved March 30, 2008. ^ "Half-Life review". Gamers Depot. Archived from the original on March 8, 2005. Retrieved March 30, 2008. ^ "Half-Life". The Electric Playground. Archived from the original on September 10, 2007. Retrieved March 30, 2008. ^ "Gamespy Title Fight! - Championship Final". GameSpy. Archived from the original on May 23, 2010. Retrieved February 22, 2008. ^ "The Gamasutra Quantum Leap Awards: First-Person Shooters". Gamasutra. Archived from the original on May 11, 2013. Retrieved September 3, 2006.